Pet time is the best time with this DC Super Hero Girls Wonder Woman Action Figure with Pet! 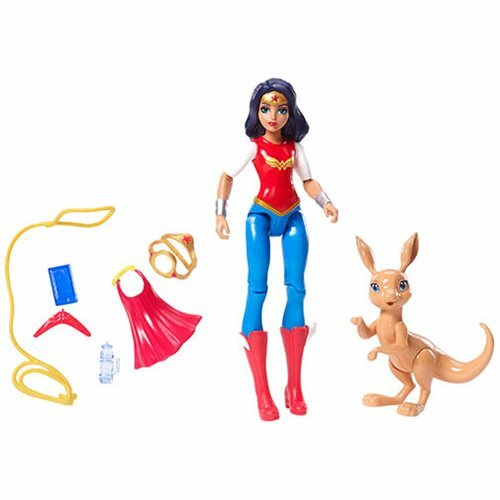 Wonder Woman and her kangaroo, Jumpa, are all geared up for lots of fun action. Wonder Woman stands about 6-inches tall and comes with fun accessories for her to train her furry friend to save the day. Accessories include her Lasso of Truth and a water bottle to make sure she stays properly hydrated all day. Jumpa can even hold the included boomerang in his mouth! Collect them all for even more super hero fun (sold separately).